Happy Friday scrappy friends! This has been a fabulous week of projects and giveaways! It's not over yet, the day 22 giveaway is here! Hope you all have fun weekend plans that involve scrapping with lots of BoBunny goodies! Stop by tomorrow for the announcement of another 5 winners of our 40k 40day giveaway! Are you loving the Pinterest inspiration board projects? Enjoy these fabulous layouts! I totally fell in love with this Pinterest inspiration board and pulled all the colors from it to put this layout together. I created a video tutorial to show you how I designed this page and you can find that on my blog by clicking on my name in the title. I mixed several collections to achieve the color variation I wanted to match the board and you can see how beautifully they work together. I really loved the roses and rosettes in the pinterest photo and I just took that and ran with it here! I also wanted to create a page with lots of movement and used string and paint dripping to achieve that effect! The frosting on the cake reminded me of torn paper strips. I LOVE adding those to my pages these days with some stitching. 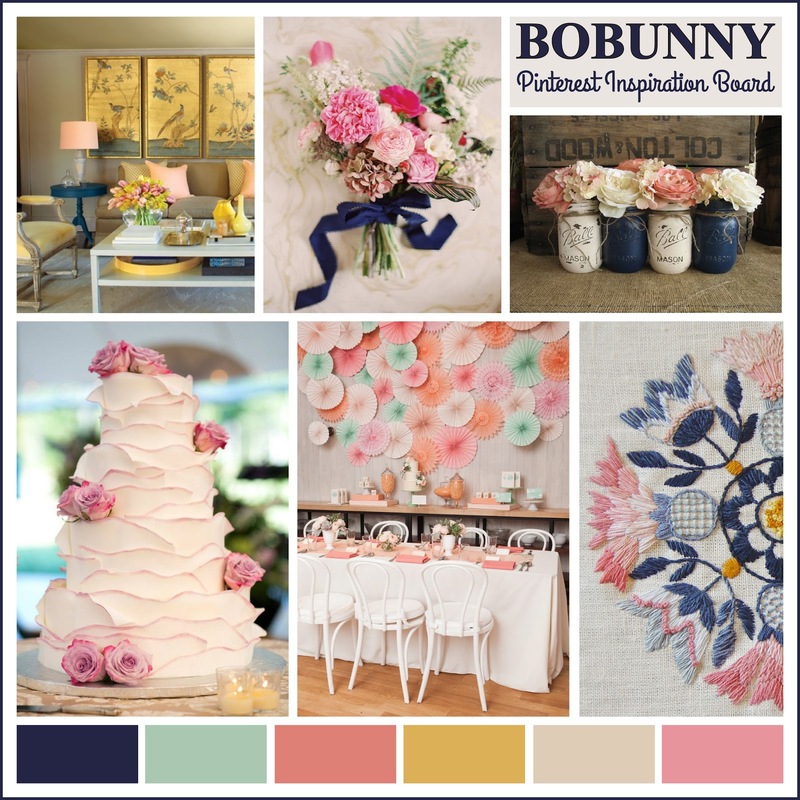 I was totally inspired by the beautiful color combination in the Pinspiration mood board. It inspired me to work with the gorgeous The Avenues collection and focus on the beautiful pink, blue, white and grey papers from this collection. 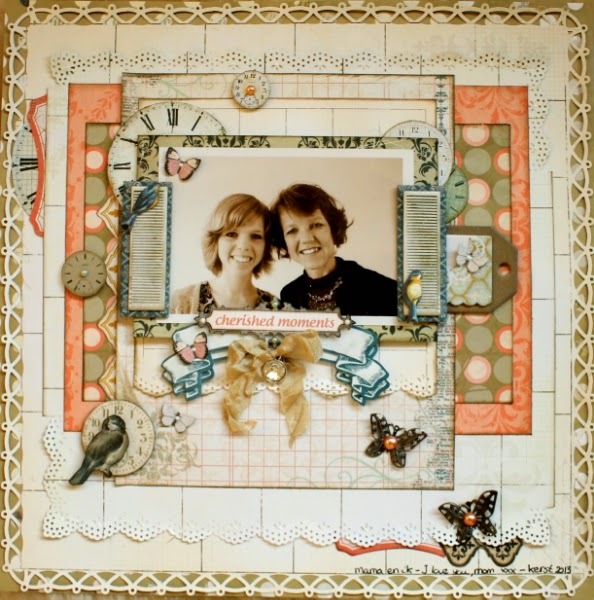 I did a lot of layering on this lay-out and layered both papers and embellishments upon each other. The clocks were cut out from the "Clocks" paper and were attached with foamtape. The lovely butterflies are from the Primrose collection. I slightly folded their butterflies to make it look like they are flying. To add some blue to my lay-out I attached the chipboard shutters from the The Avenues Layered Chipboard package on both sides of my lay-out and also added a die-cut banner from the The Avenues collection below my photo. Sometimes a contrasting color can make your photo stand out a little more. When I saw the pinterest inspiration board we had to work with I instantly fell in love, so many pretty elements on there! I really got inspired with the pinwheel picture in the lower middle part of the board. Because BoBunny followers would love to see a double layout once in a while I made mine a double one. When I started scrapping 10 years ago I use to make only double pages many of my scrapbook friends called me the queen in double pages. I can't believe how quickly I forgot how much fun it is to make double pages and I really intend to make more while I'm on this wonderful team. I combined several collection because I wanted to show you all how well all the BoBunny collections go together. The dot papers are from "Woodland Winter" one of my all time favorite collections they ever made. For my background it did some pasting, inking and stamping. I layered the butterflies to give them more depth. Love the Primrose collection though I don't actually have it yet. I think I would use these products to make cards. I would use the stamps again and again on layouts and cards! I would love to win this beautiful collection to re-create the beautiful projects that your design team has made. Primrose is beautiful, I would love to make some elegant wedding cards with this collection. Would love to use the stamps on layouts. So cute. Thanks for chance to win. 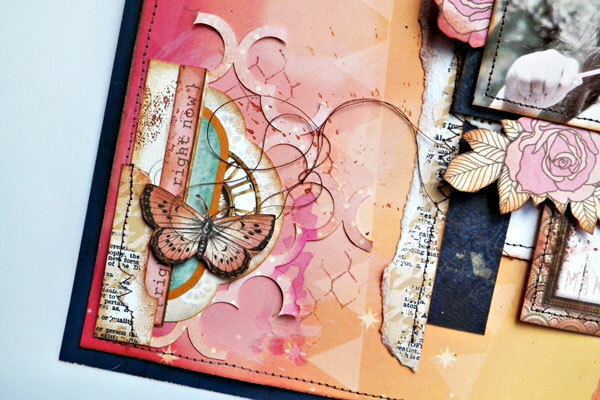 I would love to make a mini album with the beautiful Primrose papers and stamps. Love the soft pastel colors in Primrose. I would make lots of Happy Birthday cards for my sweet friends! I would love to use that gate set on cards! SO cool! Primrose is so great and sweet. Love working with it! The featured layouts are a treat for the eyes, so much to see, and so different. Well done, girls! What gorgeoous layouts these talented ladies have made!! Love the gentle look of the Primrose collection, and the softness of the butterflies etc. Would love to win this package of paper and stamps...would use on both scrapbook pages and cards! Great job everyone!! Wow! I LOVE those stamps so much. Thanks for the chance to win. I have such a crush on the gates especially. Thinking of some lovely celebration cards for those. If I won today I would make cards, tags and lots of other great projects! Love the inspiration today! I would make a little mini for my granddaughters with this collection!! Its so pretty and it would be perfect for them!! I would use the stamps on cards! Love the gate set!! Wow! Stunning projects! Would so love to win! The papers and stamps are perfect for those elegant cards I need to make! Birthday cards! All the girls in the family have June birthdays and these would be such wonderful additions to my scrap/card making tools. I could make some cards ,a layout or two and or a mini ! I would love to make some cards with this collection! Thanks! I would use this collection in my scrapbooks and then make some cards too. It's gorgeous. Awesome projects ladies. 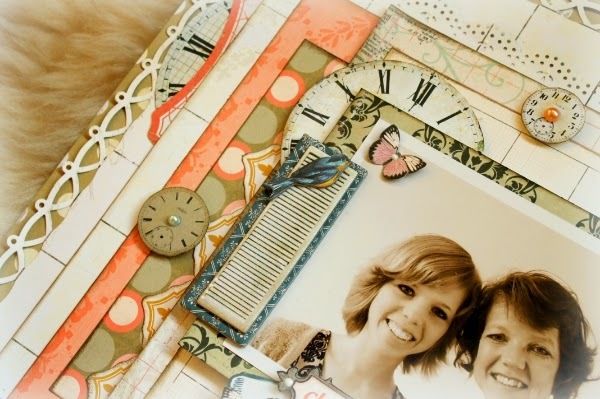 I would love to use this collection on my scrapbooking pages and cards as well. I love those fences!! Thank you for the chance to win such a great prize package. Would love to make cards and layouts with it! really lovely products!!! 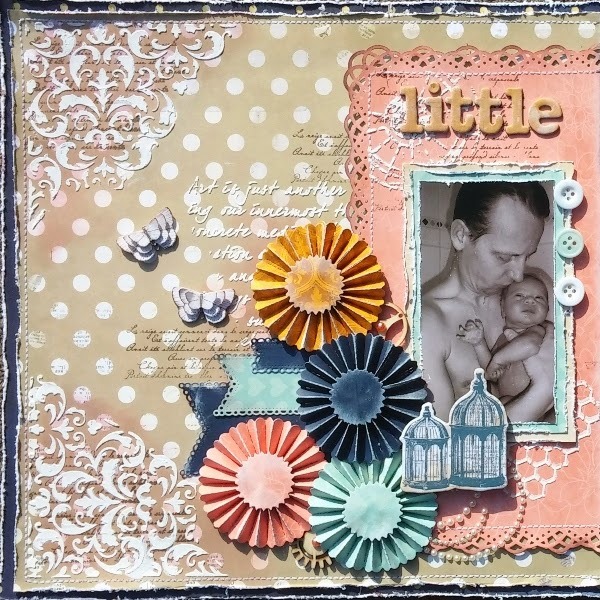 Beautiful layouts...love all the rosettes and the butterflies. Love the projects...would make cards, mini albums with them. Love to make cards and some layouts. Really amazing projects! I'd make mixed media projects for my home. Beautiful layouts. Projects are very nice. I would make Scrapbook pages and cards. These projects are all so lovely. This is a really wonderful giveaway too. Love the colours! I would create cards layouts and OTP projects! The stamps will give hours of joy and be used many, many times! This is a beautiful collection. I would make some note cards to use to write to my snail mail friends. I would make cards and LO's. The inspiration on this blog is always amazing, thank you to everyone! Gorgeous Creations!! Love the sweet collections!! Beautiful pages! I would use these lovely papers and stamps to make cards AND scrapbook pages. would love to get started on some new cards using products in this collection! This is a quite beautiful collection but the stamps are screaming to be made into a mini album with the gates on the front of it! Would look so beautiful using your Bo Bunny Collections! I LOVE that color inspiration panel and all the projects. I see lots of girly LO in store with this nw collection!! I would love to add the Primrose collection and stamps to my Misc Me binder, its so fun! Love the primrose collection. I can use it to make cards for girls or baby girls. Gorgeous paper to make pop-up box cards!! Thanks for the chance to win! Love the layouts done with the Mood Board! Awesome work! Who doesn't love Primrose? sigh. . .
Gorgeous projects again ladies!! I love seeing what you make. (And YES I love Pinterest!!!!) Love this prize pack, another great prize Bo Bunny!!!! The layout is very lovely... and the giveaway today would also make a fabulous layout!!! How i hope to win it.. i have a couple of events to put it to good use! Love it ALL! Especially the gates and fences! And the filigree! And the papers! Love it ALL! I would definitely use it for cards...but it's all so pretty I may be tempted to try some scrap-booking! These are perfect for card making! That's what I would do! But I can see a scrapbook page as well! Love these layouts! I really like creating mini scrapbooks! Beautiful layouts! I would use the 6 x 6 paper pad to make a mini album. I can see myself making a lot of beautiful cards with these products! I'd make beautiful layouts and cards with these products. Love these colors, they remind me of sherbert ice cream! Gorgeous layouts with beautiful colors. 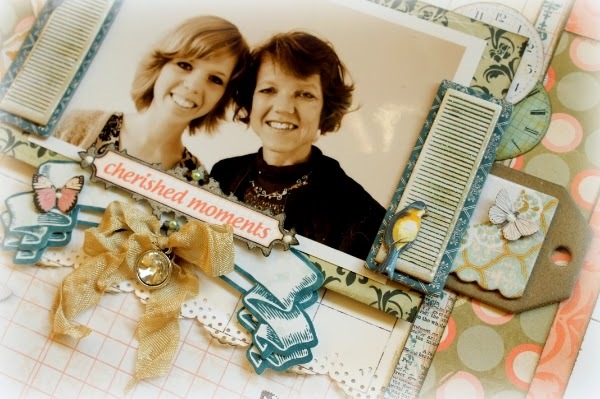 I would make layouts of my granddaughters and cards for my friends. Thanks for the chance to win. I would make cards for Hospitalized Kids and Operation Write Home. 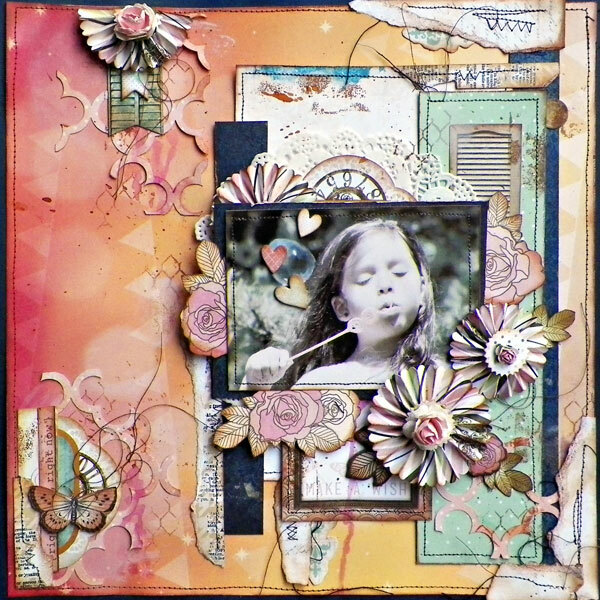 The 6X6 work so good for cards and there is soom many to be make for this collection. I would make a garden greenhouse with a mini album inside and lots of enchanting flowers out and in!!! I would make cards, lots of cards from this fantastic prize! The DT projects are awesome! would be great for cards! The Primrose collection is beautiful - bursting with soft, girly deliciousness! I have the perfect altered project in mind for this! Everything goes toward my greeting cards. I have some mixed media projects that I want to work on - but they seem to stay on the back-burner. If they ever move up the collection will go towards those. Oh, the inspiration today is amazing!! Thanks for the chance to win these goodies....I see cards with this prize!! Awesome stamps and paper pad! I'd make lots of cards and ATCs! I would do a canvas piece! Thanks for a great giveaway! I would make some spring layouts and cards. I would use it to make a Foto Folio from Paper Phenomenon! Thanks for the chance! Great layouts and of course great products, I would love to make some layouts with this.!!! Awesome layouts today! Love the Avenues. I would scrap lots of layouts and make cards with anything left over. 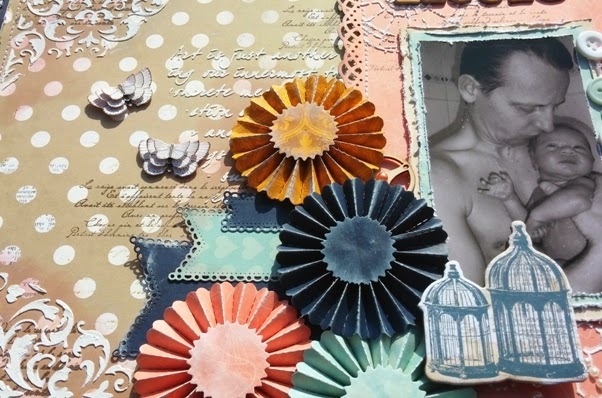 I would make beautiful cards and scrapbook pages! No doubt! So much gorgeousness! 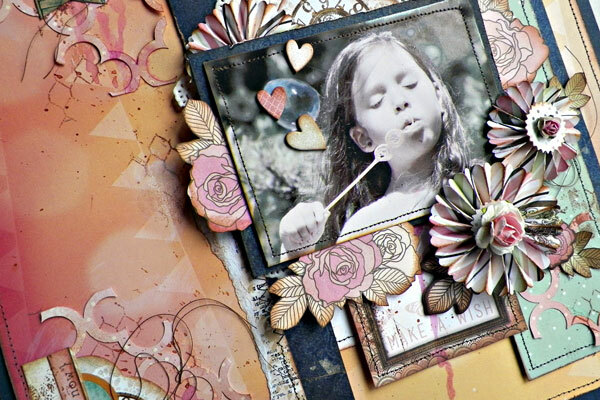 I would create lots of fantastic layouts and mixed media projects with this beautiful collection! I'd make more cards for OWH. All of the Primrose Collection is lovely, but those Gateway stamps are really terrific! I'm picturing them in some of my heritage pages. I'd be making cards mostly. I love making cards so I would use this prize for cardmaking and girlie layouts! wow do I love those stamps! I would use them to make cards and maybe even home decor projects. Beautiful! Thanks for all of the chances to win. TOTALLY AWESOME layouts to inspire us today - LOVE the details, designs and dimension!!! Primrose collection is beautiful, the colors and the butterfly awesome. I would use this product for art journals, mixed media and heritage/ancestry scrapbooking! BEAUTIFUL! How inspirational! Love, love, love the papers! I love the Primrose collection! Would love to scrap some baby pics and make beautiful cards with them! I loved your day 21 giveaway best, I loved the gates and the paper. There are so many things BoBunny makes that I simply love. Thank you for the chance! I would use these dot papers to catch up on all my scrapbook projects this summer while I am off from school!! !